Anniversary sale @ MOOD ! You are invited to a special event – a 50% OFF SALE! It’s been an amazing journey. and I wish to thank you all so very much for making this an incredible adventure, it’s with your support, feedback and participation in events and sales that has been remarkable – and without you, MOOD would not be here. 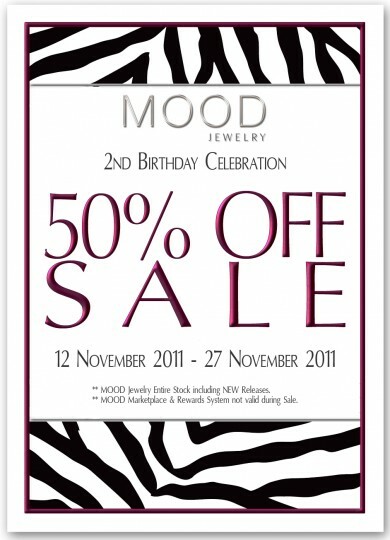 MOOD’s 50% OFF Sale is from Saturday, 12 Nov 2011 – Sunday, 27 Nov 2011. NOW is the time to come in, check out MOOD, pick up pieces or ensembles you’ve missed along with NEW Releases throughout the event. Browse our new main showroom and SAVE! So thank you, again, from the bottom of my heart! Dieser Beitrag wurde unter bloggies from Sawa, Sales abgelegt und mit MOOD, sale verschlagwortet. Setze ein Lesezeichen auf den Permalink.